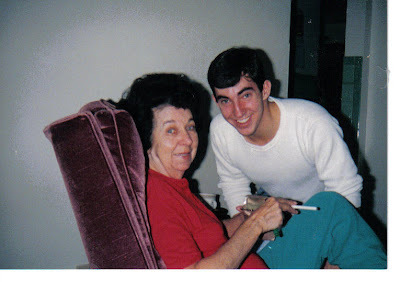 The song "Smokes gets in your Eyes" reminds me of my dear mother. She used to smoke like a train, which eventually led to lung cancer. It wasn't until I got older that I figured out why I always had sinus infections and colds when I was growing up. I always seemed to be sick more often than my friends but never knew why. Yep, it was the second-hand smoke. After I moved away from home, I seldom ever got sick and to this day, I seldom ever get sick. I avoid people that smoke, especially when my kids are with me. I don't want to expose them to this unnecessary evil. Aside from her chain smoking, she was a great mother to all of us kids. She would wake up every morning really early and make breakfast and send us all off to school. She never missed a day, even when she was sick. She was really awesome and I miss the long talks we'd have and the time spent together. Should I title this Smoke gets in your lungs? I'm touch John... blame it to the big greedy tobacco corporation for promoting and selling cigarrette, I'm glad that there are now campaigns against smoking, it's really bad for anyone's health.. gosh hehehe you look so young in that pic. Yes smoking is indeed injurious, de it for a direct smoker or a passive smoker..hope people understand this and quit smoking. That's a great picture! Your mother sounds like she was on top of it! I remember when I was younger, my mom smoked everywhere. At home, in the car, etc! It used to gross me out. I'm so glad she quit when she got older. It's such a bad habit, and hard to break. I'm so glad I never got into smoking. What a sweet post!! LOL, "Smoke gets in your lungs' sounds funny!! May she rest in peace. As you described how you always got sick when you were growing up, I thought, oh-oh... me too. My mother and I were second-hand smokers, father being a chain smoker (3 packs a day). The doctor forbade him to smoke around us. But despite the smoking they were certainly great parents, weren't they? Touching and thought provoking all at the same time. Your mom sounds like an amazing mom...I could learn from her to get up in the morning and do the whole breakfast thing...something I struggle with! Your mom's beautiful! Sad to learn that she succumbed to lung cancer. My parents BOTH used to smoke like chimneys!!! Oh! so sorry for your good mother. I am glad you have learned that smoking is dangerous to health. Just pray hard that one day, perhaps, no more smokers in this world.